A magician's illusion mimics a cloak of invisibility. It’s a good trick, you have to hand it to him. My friend (and evil twin) Richard Wiseman is a staple here at BA HQ; he studies how our brains can be tricked into perceiving things that aren’t real … or missing things that really are there. His latest entry into encephallusions* is masterful. Almost a century ago, the brilliant magician Robert Harbin came up with a way to seemingly cloak someone, as if part of them were to become invisible. It’s never been done in practice … until now. Richard—with a little help—made it real, and put together a wonderful video demonstrating it. Did you guess correctly? I did, kinda; I knew it had to do with reflections and angles, though I didn’t go to the trouble of doing the actual ray tracing (that is, figuring out the direction the light traveled). It’s very clever, and like a good showman Richard really sells it by moving his arm behind the ninja, making it look like she really is cloaked. But there’s something he doesn’t explain in the video, and since it’s science, I will. Did you see him drop the bead in the bowl of water only to have it disappear? How does that work? It has to do with refraction, the bending of light. When light travels from one medium (say, air) to another (say, water) at an angle it bends a little bit, changing the direction it travels. It’s actually changing its speed, and the amount of change depends on the material through which light is traveling. The amount by which the material can change the light’s speed (and the angle at which it bends) is called the index of refraction. It’s just a number that falls out of the equations, and, for example, water has an index of refraction of about 1.33. 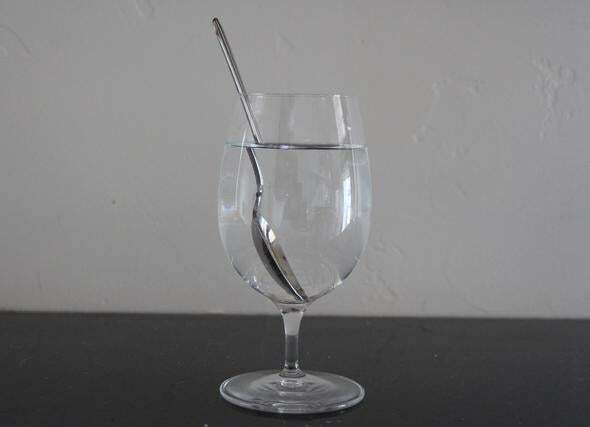 You’ve seen this lots of times; it’s why a spoon looks bent when you stick it in a glass of water (it also distorts the Sun, Moon, and stars when they set as their light passes through our atmosphere). If you put something transparent in water, though, things can get weirder. If that object has a different index, the light passing through the water bends a little when it passes through that object, distorting the view. Usually, this makes it a bit easier to see the object because you can see its edges better where the light is distorted. But if the object has an index of refraction equal to that of water, the light passes right through it without distortion, and the object seems to disappear! The glass beads Richard used in the video have the same index as water, so when he dropped them in they disappeared from view. Science! Ain’t it grand? And it’s useful: It can really help you understand when you’re being fooled, whether it’s just your brain not perceiving things the way they should be, or because someone is trying to fool you. But either way, it’s your best bet. * Yes I just made that word up. I do that sometimes.